Organizational institutionalism has shown how institutional entrepreneurs can introduce new logics into fields and push for their broader acceptance. In academic science in the United States, however, market logic gained strength without such an entrepreneurial project. This article proposes an alternative “practice selection” model to explain how a new institutional logic can gain strength when local innovations interact with changes outside the field. Actors within a field are always experimenting with practices grounded in a variety of logics. When one logic is dominant, innovations based on alternative logics may have trouble gaining the resources they need to become more broadly institutionalized. But if a changing environment starts systematically to favor practices based on an alternative logic, that logic can become stronger even in the absence of a coherent project to promote it. This is what happened in US academic science, as growing political concern with the economic impact of innovation changed the field’s environment in ways that encouraged the spread of local market-logic practices. I would like to thank Kecia Johnson, Joanne Kaufman, Ryan King, Richard Lachmann, Nicholas Pagnucco, Lisa Stampnitzky, Kate Strully, Sapna Swaroop, and Jim Zetka for their helpful comments on previous drafts of this article. An earlier version was presented at the 2008 American Sociological Association meeting in San Francisco. This research was supported by a Spencer Foundation dissertation fellowship, the SSRC Corporation as a Social Institution program, and the UC Berkeley Center for Studies in Higher Education. 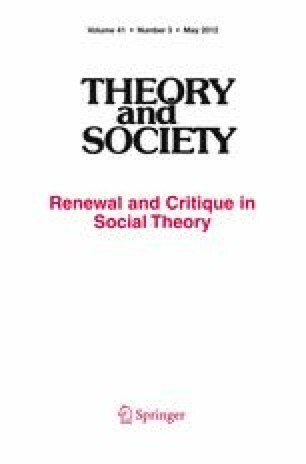 I am grateful to the Theory & Society Editors as well as to several anonymous reviewers for their constructive feedback. Gray, D., Gidley, T., & Koester, N. (1987). 1986–1987 Center Director Report. Industry/University Cooperative Research Centers Program Evaluation Project. http://www.ncsu.edu/iucrc/PDFs/scanned%20CD%20reports/CD%2086-87.pdf. Accessed 23 May 2011. Gray, D. O., & Baneth, R. C. (1992). 1990–1991 structural information. http://www.ncsu.edu/iucrc/PDFs/scanned%20CD%20reports/CD%2090-91.pdf. Industry/University Cooperative Research Centers Program Evaluation Project. Accessed 23 May 2011. McGowen, L. (2008). Predictors of cooperative research centers post-graduation success: Update. Industry/University Cooperative Research Centers Program Evaluation Project. http://www.ncsu.edu/iucrc/Jan’08/McGowenNSF%201-9-08denis.pdf. Accessed 23 May 2011. US Patent and Trademark Office (PTO). (2011). US patent activity: Calendar years 1790 to the present. US Patent and Trademark Office. http://www.uspto.gov/web/offices/ac/ido/oeip/taf/h_counts.htm. Accessed 23 May 2011.